More than 1,500 community gardens have been started on vacant land in Detroit alone in recent years. A growing movement is spreading throughout U.S. cities that is feeding people, providing jobs, and helping the environment—urban farming. This is a lot bigger than putting some tomato and zucchini plants in your backyard. These are local efforts, city by city, neighborhood by neighborhood, to convert vacant land in America’s cities into small farms. Sometimes it’s not even vacant land. In New York City, for instance, there are plans this summer for a floating food forest on a barge going up and down the Hudson River that will let people come and pick produce—for free. Other urban farms are on rooftops. Some are along traffic median strips. Some are indoor vertical farms. Some are mobile farms that go from vacant lot to vacant lot, moving when land is developed and the garden must move to another open spot. Others are intensive hydroponic and aquaculture operations. And some stretch over acres of urban land, like a project in Seattle that invites residents to work together to plant and harvest—all for free. At the same time, the food grown in these urban food forests and farms helps residents regenerate the land and improve the area’s ecosystem. All of this takes “eating local” to a whole new level. It’s impossible to estimate the number of urban farms across the country, since the efforts are so local. Some might start as a few neighbors planting together on a vacant strip. Others are part of an organized effort through community organizations to provide jobs for inner-city residents to work on farms and sell produce, often in the midst of food deserts. One estimate is that there are as many as 100 full-fledged food forests, with a mix of trees and smaller plants in a succession of layers, in the United States. One Detroit group reports that there are 70 urban farms in that city alone that sell fruits and vegetables to local market outlets. The Chicago Urban Agriculture Mapping Project is trying to locate small produce gardens throughout the Windy City—a 2015 count found 830. There’s even a worldwide organization called Urban Farming that claims more than 63,000 small community gardens based in cities, and the Food and Agriculture Organization of the United Nations estimates that up to 20 percent of the world’s food supply is grown in cities. Food industry estimates show that U.S. local food sales totaled at least $12 billion in 2014, up from $5 billion in 2008, according to the U.S. Department of Agriculture. Experts anticipate that figure to hit $20 billion by 2019. Urban farming certainly isn’t going to solve all the problems in the nation’s cities, nor will it provide enough jobs to support unemployed workers who lost jobs to a shrinking manufacturing base. But urban agriculture is making a difference in using vacant land and in providing more healthy food to residents in city neighborhoods that have been abandoned by national grocery chains. In lieu of definitive facts and figures, we instead will offer descriptions of just a few projects in several cities across America. The barge is a collaboration between 18 farming, arts, and urban revitalization organizations and a whole slew of artists and educators dedicated to turning New York’s often-overlooked water resources into something that literally and figuratively feeds the community. Everyone from high school students to the U.S. Coast Guard is involved in the project. Seedlings are now being grown on land to transplant to the barge when construction is complete. The forest will feature more than 80 species of trees, herb plants, and flowers that grow apples, pears, scallions, rosemary, bok choy, and Chinese mountain yams. Others on the planned list of food include annuals such as arugula and cherry tomatoes; perennials such as various berries; runners such as asparagus and Jerusalem artichoke; and a host of greens. Plants will be watered using captured rainwater. There also are plans to use river water, which would need to be filtered and desalinated first. Swale is sponsored through the New York Foundation for the Arts. Although the project has raised $32,000 for its implementation—about half the budget it needs—it still is seeking more monetary donations. Swale also will serve as a floating home for art installations, performances, and workshops. The art space on board the Swale boat will be called Eco_Hack 2016. It, too, is seeking donations. Salt spray from the river could damage the plants, and saltwater must be purified before it can be used for irrigation. But the forest’s design will create a saltwater marsh around the edge of the barge, and then that will help clean and desalinate water from the Hudson River that will go on to irrigate the other crops. Salt-tolerant plants like tomatoes and artichokes will then go inside the initial perimeter. If all goes as planned, Mattingly says Swale could produce up to 6,000 pounds of food in its first year—a harvest comparable to traditional food forests of similar size. “We want to turn what could be challenges into positives,” she says. Seattle. Seattle is home to the Beacon Food Forest, an urban forest garden built on public land in Seattle’s multi-cultural Beacon Hill neighborhood, a few miles from downtown Seattle. Phase One, at two acres, became fully up and running in 2014; Phase Two aims to cover seven acres. It’s an all-volunteer project with 90 to 120 people helping out regularly. It was the first large-scale urban food forest in the country and has become world-renowned. Those who volunteer their time at the Beacon Food Forest accrue hours to get their own P-Patch plot, one per household. Donated hours are given through “community work parties” and can be in the form of “physical labor, organizing, fundraising, and administrative tasks,” according to the group’s website. There is a list of some 2,500 volunteers in all. The land came from Seattle Public Utilities and Seattle Parks and Recreation. Beacon Food Forest’s “open forage” approach allows anyone to come in and sample what’s growing. Funding comes from grants and donations. The first grant, for $22,000, came from the Seattle Department of Neighborhoods and was used to hire a design team for the project and outreach, with postcards printed in five languages and mailed to 6,000 people in the surrounding neighborhood. Beacon Food Forest now even offers a week-long summer camp for kids to learn about urban farming. Here’s a video explaining more about the Beacon Food Forest, which started in 2009 as a final project for a permaculture design course. The food forest is set up as a woodland ecosystem using edible trees, shrubs, perennials, and annuals. Fruit and nut trees make up the upper level, while berry shrubs, edible perennials, and annuals are on the lower levels. And lest anyone thinks the free produce will be picked clean, the overabundance of fresh fruit and vegetables is so plentiful that volunteers set up a roadside stand at the end of the harvest. They still gave away the produce for free. Chicago FarmWorks will produce over ten thousand pounds of vegetables that will be distributed throughout the community to people in need. … Participants in FarmWorks’ transitional jobs program, all of whom face multiple barriers to employment, will find good jobs. 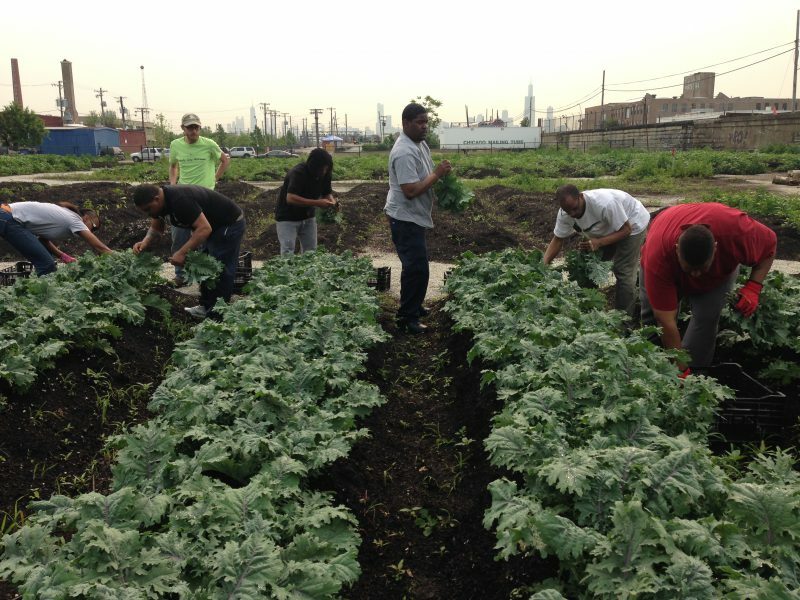 … Chicago FarmWorks and others across Heartland Alliance and the Chicago community will have produced 30,000 servings of vegetables and will have helped dozens find full-time, meaningful employment. Chicago FarmWorks broke ground in 2012 and is now planting crops for 2016. FarmWorks’ vegetables are distributed through food pantries in coordination with Heartland Alliance’s health outreach component, which also offers advice on nutrition. The program was developed in partnership with the City of Chicago, NeighborSpace, and the Greater Chicago Food Depository. All produce is picked and distributed to food pantries within 24 hours. Last year, the produce went to about 1,400 food pantry clients. Jessica Surma is the urban agriculture coordinator for Chicago FarmWorks. She plans the farm, handling its administrative aspects, and supervises the transitional job participants. She also coordinates another urban agriculture project at Harvest Commons, a long-term supportive housing facility nearby where residents and staff grow vegetables to be consumed solely by the residents. Surma supervises five groups of six people each in the 10-week transitional jobs program during the growing season of March through October. Those employed in the program work two days per week on the farm and two days at a food warehouse. On Fridays, they meet with an employment placement coordinator to take part in a math and reading curriculum and receive support in job application skills. Some are hired by outside employers while still in the program, Surma says. Some of the jobs program participants are ex-offenders, are formerly homeless, have low literacy, or are re-entering the job market after a long illness. Since 2013, 83 percent of the participants in Chicago FarmWorks’ transitional job training program have found long-term employment. The farm is mainly supported by private foundations, but it does generate some revenue. The produce is sustainably grown and sold to food pantries at much lower rates than private wholesalers and then distributed for free to local residents. All produce is certified by the Greater Chicago Food Depository (which, after volunteering there, I can personally attest is one of the best-run food pantry distribution organizations I have ever seen). “We also grow flowers to sell to local florists in areas of the farm where we can’t grow vegetables to raise funds,” Surma says. Another program in Chicago is a large aquaponics program on the West Side called Metropolitan Farms. It combines fish farming and a hydroponic growing system under one roof, and the fish waste from the tilapia is used to fertilize lettuce, kale, and a dozen herbs. The 10,000-square-foot facility was built on a neglected concrete patch along an industrial corridor—an old dairy that had gone out of business. Detroit. This city, with its decimated population and large swaths of abandoned decaying properties (and empty lots where those properties have been torn down), is ripe for urban agriculture, and it’s starting to boom. 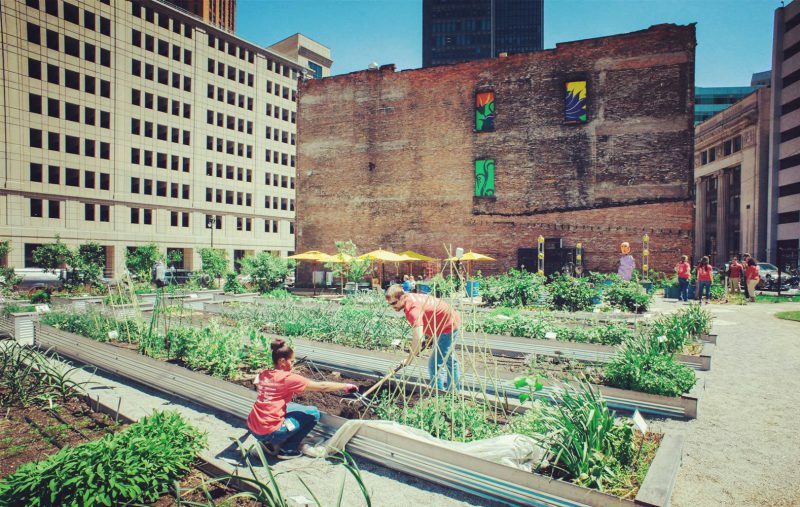 There are many nonprofit organizations in Detroit that are leading the way in urban farming, from reusing vacant plots of land to planting groves of trees. Many efforts are coordinated through the nonprofit Greening of Detroit. The movement has been developing over several years, but it just keeps growing. Detroit also has a 24-acre Eastern Market in its downtown area that sells fresh produce, often to local restaurants, twice a week during the growing season and every Saturday all year round. More and more, much of that produce is being grown in the city itself. This video gives an overview of some of Detroit’s urban farming efforts, from small urban gardens to larger-scale urban farming operations. The video is long and also gives a history of the city’s downturn, but the relevant details about urban farming start a few minutes in. Since this documentary was made, Detroit’s urban farming movement has grown further. There are more than 1,500 community gardens in the city today, many developed in association with the nonprofit groups. The Greening of Detroit also has a 2.5-acre small-scale production farm near Eastern Market and offers classes in nutrition, gardening techniques, exercise, and healthy cooking. Its Detroit Conservation Corps Adult Workforce Training Program also offers paid training for adults in “green” careers such as landscaping and floral design. The group’s work is funded by many corporate and private sponsors. I happened to visit Detroit last fall, and as we drove around the city, from the downtown to the suburbs, I remember being struck by the sheer number of block-long gardens that I saw. Those looking for government resources can find them through the USDA, which offers an Urban Agriculture Toolkit. Information includes how to access financial and technical assistance for an urban garden startup and how to become authorized to accept different payment models, such as SNAP and WIC, for your produce. Let’s end with someone who has created an urban garden at the famous address of 1600 Pennsylvania Avenue—First Lady Michelle Obama. In 2009, FLOTUS broke ground on the South Lawn of the White House to create a vegetable garden and invited children from local schools to help. It was a way to enlarge the conversation about healthy eating and turned into her “Let’s Move!” campaign, which emphasized exercise as well as better diets. Local kids have helped with the White House kitchen garden ever since. “It was eight years ago that we cooked up this really interesting idea that maybe we could dig up some dirt on the South Lawn … and we would plant a wonderful garden that would be a space for us to talk about the food we eat,” she said during the planting of the garden in April, according to the White House blog. 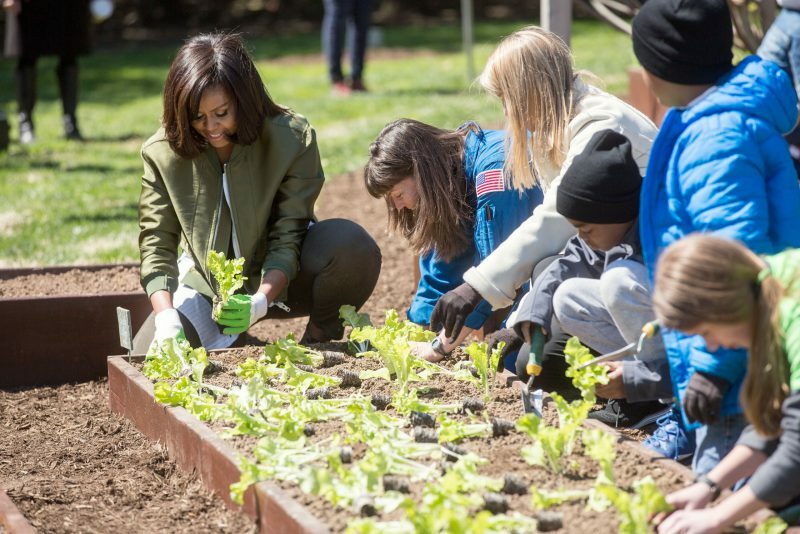 In April, Michelle Obama planted her final White House kitchen garden, along with helpers from local schools—and a few from NASA. Originally posted on Daily Kos on March 15, 2016.